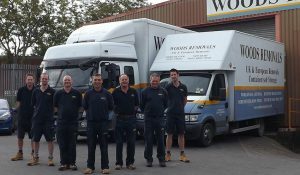 Removals Company South Dorset, Woods Removals South Dorset Ltd.
Removals in South Dorset go wonderfully well when you take advantage of our 140 years of experience. There’s no finer feeling than being settled in your new home from the very first day you occupy it. With our packing and unpacking service, that’s exactly what you can expect. Moving without stress and exhaustion is something we’ve perfected and no matter what the shape or size of your move is, we’ll get it done. Our full-time, BAR-trained (British Association of Removers) personnel are caring and they’ll come equipped with exactly the right packaging materials for your belongings. We’re devoted to the craft of moving and we’ve got it down to a fine art. Removal companies in South Dorset didn’t used to be this way – we feel we’ve transformed the experience, making it streamlined and straightforward. And if you decide, as some clients do, to do your own packing and unpacking, we won’t leave you to twist in the wind – we’ll be at hand to advise and guide at every juncture. Your move begins on the day our estimator pays you a call and gets all the details of your move down, so that a clear and accurate quotation can be issued. If you decide to go ahead, then we’ll begin planning to ensure a favourable and happy outcome. We also offer storage in South Dorset, and it’s incredibly useful to many of our moving clients who sometimes find themselves with an excess of belongings. All the consideration and care we bring to South Dorset moves is also apparent in our office moves, European moves and international moves – we have a full array of services. If you’ve moved before, you may have come to believe that problems are inevitable, but they aren’t. Because we’ve been going for so long, we’ve devised solutions that come into play before the problems even occur, heading them off and keeping the show on the road. Among the packing materials we use are acid-free tissue paper (prevents silverware from being tarnished) and cushion craft wrapping (for fragile goods such as glass and china). Whether you’re moving locally or from one end of the country to the other, we’ll make it happen exactly how and when you want.